Western-Style Japanese knife shapes featuring a VG10 core clad in Stainless Steel. The entire blade, core and cladding, are forged and tempered. Nicely rounded spine for comfort and a triple-riveted POM handle. Gyutos are compound 70/30 right hand bevels, while all other shapes in this line are double beveled. 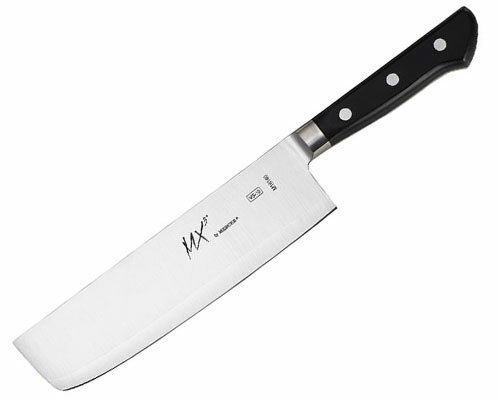 Mercer Mx3 8 in Gyuto is the most widely used size for a chef knife. Unique to this knife line is that the blade is fully forged (not just the core) giving the knife excellent strength and flexibility. Meaning that if you flex this knife, it doesn't stay bent. Mercer MX3 240mm Gyuto is my preferred size for a chef knife, and I highly recommend this product. If you want thin, hard, ultra-sharp steel with excellent edge retention and don't care about a mirror polish, then give this a try. 70/30 bevel with a very comfortable rounded spine and a great edge right out of the box. Mercer MX3 270mm Gyuto is a large knife favored by cooks who do large amounts of vegetable prep. 70/30 compound bevel, nicely rounded spine, bolster and riveted handle. Great out of the box sharpness and excellent flexibility for VG10 steel. 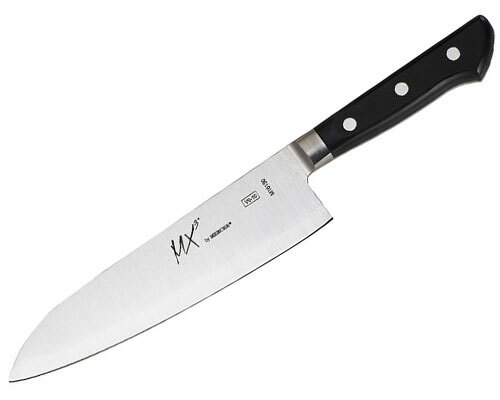 Mercer MX3 300mm Gyuto is an extra large knife favored by cooks who do large amounts of vegetable prep. 70/30 compound bevel, nicely rounded spine, bolster and riveted handle. Great out of the box sharpness and excellent flexibility for VG10 steel. 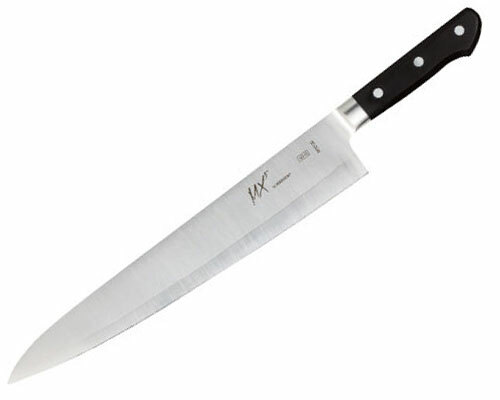 Mercer Mx3 185mm Nakiri is ostensibly a vegetable knife. I find them to be fun to use and very versatile. Smash garlic, dice onions, use the wide blade to lift product from cutting board to pan and I never ding the tip. 50/50 bevel, strong and sharp. Mercer Mx3 7 in Santoku gives you the benefit of a chef knife while being more nimble due to the reduced length. Slight camber for rocking cuts, with a tip low on the knife for stripping celery and other tasks of this nature. 50/50 bevel. Mercer MX3 6 in. (150mm) utility is a small knife used for close hand work, fine dicing, peeling and coring. 50/50 bevel, fully forged VG10 clad with stainless steel. Mercer MX3 120mm Petty knife is a small knife used for close hand work, fine dicing, peeling and coring. 50/50 bevel, fully forged VG10 clad with stainless steel.